Anchored up or drifting over Miami’s numerous wrecks and reefs can produce some of the best action on the water. You can find Snapper, Grouper, Cobia and Amberjacks lurking in the depths. Miami is home for many sunken shipwrecks. Most of them were sunk intentionally in the late 70’s and early 80’s. Some boats sunk in the 80’s were confiscated from the government for drug running and sunk in strategic locations. 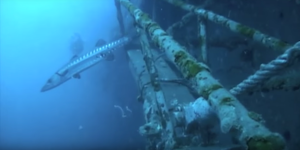 These sunken shipwrecks have become a habitat for species such as Grouper, Mutton Snapper, Cobia, Amberjack, African Pompano, Permit and many others. We anchor up current of these structures and chum the fish to us. We usually have two rods on the bottom and two on the surface. The surface baits will catch Kingfish, Bonito, Tuna, Sailfish and Dorado. BEWARE — you need to have some big muscles for this. 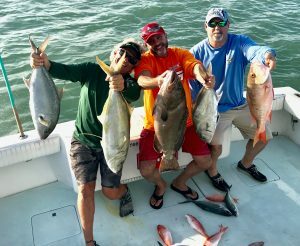 Amberjacks and Groupers will fight harder than anything else when trying to get back to their home, and when they hit a massive tug of war begins. 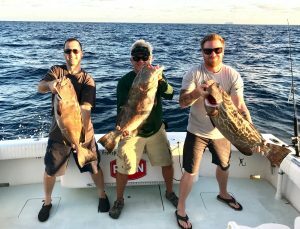 The Groupers here can weigh up to 50 pounds, but most are in the 25-pound class. All the bottom species are very good eating.